The Estipona Group held its inaugural Putt-Putt Classic andraised $2,000 for a new fund to benefit the homeless population in Reno that will be administered by the Community Foundation of Western Nevada. ‘The Putterfields’ won best costume. They charmed our socks off! The event drew participants from diverse members of the Reno community — including government organizations (like the Nevada Housing Division and Reno City Council), several philanthropic companies and organizations and even some charitably minded residents. The donations will benefit local organizations that serve the homeless community; the Estipona Group continues to raise money for its Good Deeds Fund, which will accept nominations for two beneficiaries of the fund (must be an organization that serves the homeless) and will make the award in January 2018. Estipona Group is making a quarterly donation to the Good Deeds Fund from revenue. The Estipona Putt-Putt Classic is part of the Estipona Group’s 24 Years 24 Deeds campaign, which curates 24 opportunities to volunteer the team’s time, money and resources to benefit the local community. You can learn more about the campaign by visiting http://www.estiponagroup.com/our-story/good-deeds/. The ‘Bone Crushers’ excelled at getting-in-the-heads of their opponents. 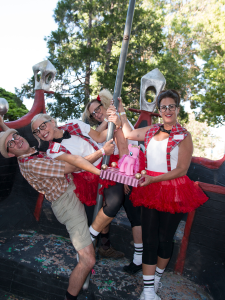 The mini-golf tourney drew 20 teams together from diverse fields like advertising, healthcare, non-profits, financial services and beyond to compete, network (most wearing costumes, which was encouraged as part of the competition) and enjoy a sunny afternoon at Magic Carpet Golf. 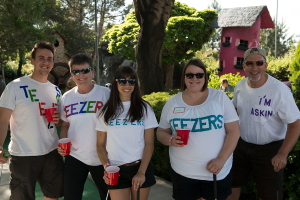 Renown’s team, What What in the Putt, took home the championship cup with a score of 35, while a Northern Nevada Medical Center/Bliss Babe team, the Putterfields, took home best-dressed. Great Basin Federal Credit Union won the ‘Shiny Object Award’ (for worst score); the Nevada Housing Division won an award for sportsmanship, having arrived in suits directly from the state legislature; and the team from Dynagraphics, called Dino Graphics, took home the award for best injury — after tripping over their dinosaur feet. The Community Foundation of Western Nevada has distributed more than $90 million in grants through more than 220 charitable funds to strength our community. You can learn more about them by visiting http://nevadafund.org/. The Community Foundation’s ‘Teezers’ are ready to get to work helping the city’s homeless residents. For more than 24 years, the Estipona Group Advertising and Public Relations team has been providing marketing communications that capture attention, engage audiences and deliver results to local, regional and national clients based throughout the United States. For more information, visit www.estiponagroup.com.